Fire Alarm Systems are designed to detect the unwanted presence of fire by monitoring environmental changes associated with combustion. 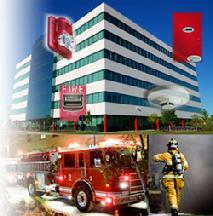 In general, a fire alarm system is either classified as automatically actuated, manually actuated, or both. Automatic fire alarm systems can be used to notify people to evacuate in the event of a fire or other emergency, to summon emergency services, and to prepare the structure and associated systems to control the spread of fire and smoke. After fire protection goals are established - usually by referencing the minimum levels of protection mandated by the appropriate model building code, insurance agencies, and other authorities - Venture Communications & Security will detail specific components, arrangements, and interfaces necessary to accomplish these goals. Venture Communications & Security has partnered with VES Fire Detection Systems, which was founded with one mission: to give dealers a comprehensive, cost-effective means of providing fire detection networks for corporate, educational, government and retail campuses of any size using 21st century technologies. We are also dedicated to providing systems that are easy for End-users to interact with. One of the fastest growing fire alarm manufacturers in the United States, VES has taken a total system approach to protection with the introduction of the eLAN™ Fire Panel and eSP™ Software Suite to meet the needs of its rapidly expanding client base. VES is the first and only Fire Alarm Manufacturer to allow true web-enabled programming, troubleshooting and servicing of Engineered Systems. Their programming methodology provided the installing dealer with a single secure database and easy Drag & Drop style configuration. With a full compliment of software and hardware engineers on staff, VES takes advantage of the very latest technologies to deliver quality products & services. VES products are UL-listed, FM and CSFM approved and are distributed exclusively through a network of authorized dealers, including Venture Communications & Security LLC.